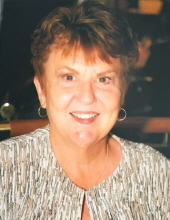 Karen Macdonald Adams passed away February 3rd, 2019 in Mesa, Arizona surrounded by all of her children and her husband. She is survived by her husband David, her five children Michelle & Dave, Ingrid & Scott, David & Tasha, Julie & Brad, and Clint & Alix, 16 grandchildren, and 1 great-grandchild. Karen was a remarkable woman. Her joy and legacy were her family. She loved her children and grandchildren with a relentless loyalty, always attending games, performances, and activities. Karen had the ability to bring people together and to enjoy life to the fullest. Her tenacity for life was shown in her love of travel, her outgoing personality, and her effortless ability to serve everyone around her. She traveled the world with her husband David, her friends, and her family. Karen never met a stranger. Karen loved the gospel and her Savior. That love was integrated into the way she treated others. She loved without question and found great comfort in the closeness she felt with each of her children. As a mother, wife, aunt, grandma, and friend, she will be greatly missed. We take comfort in knowing that families are forever and she has joined her parents Keith and Ada, her brother Edwin, her daughter Allison, and her grandson Troy. We know she is busy elsewhere and we look forward to reuniting with her. Karen is very loved. A viewing in honor of Karen will be held Saturday, February 9th from 9:30am-11:30am. Following the viewing, a funeral service will commence at 12:00pm. Viewing and funeral services will take place at the Monticello, Utah North Chapel. To plant a tree in memory of Karen Macdonald Adams, please visit our Tribute Store. "Email Address" would like to share the life celebration of Karen Macdonald Adams. Click on the "link" to go to share a favorite memory or leave a condolence message for the family.